And now.. a reference post describing a train car in detail, so if I refer to any part of it by its name in another post, you’ll know what I’m talking about. The cars are symmetrical, so it wouldn’t be helpful to describe them by “front end” or “back end” – so instead there is the A-end and B-end. C is the section in the middle, because we enjoy being difficult like that. Not symmetrical since there is only one cab per car. So the cab is always the A-end, and the parlor area where passengers can sit is always the B-end. On top of the train is the pantograph. In the Type 1s, 2s, and 3s, the elbow of the pantograph points towards the B cab and the open part points towards the A cab – it’s the quickest way to tell when you’re outside the car which end is A and which end is B, which is necessary for some troubleshooting procedures. In the Type 4s, that’s reversed – the open part of the pan points to the B-end and the elbow points to the A-end, because as I said, we enjoy being difficult. But it’s always easier to tell which end of the 4 is A and which is B, since only A has a cab. 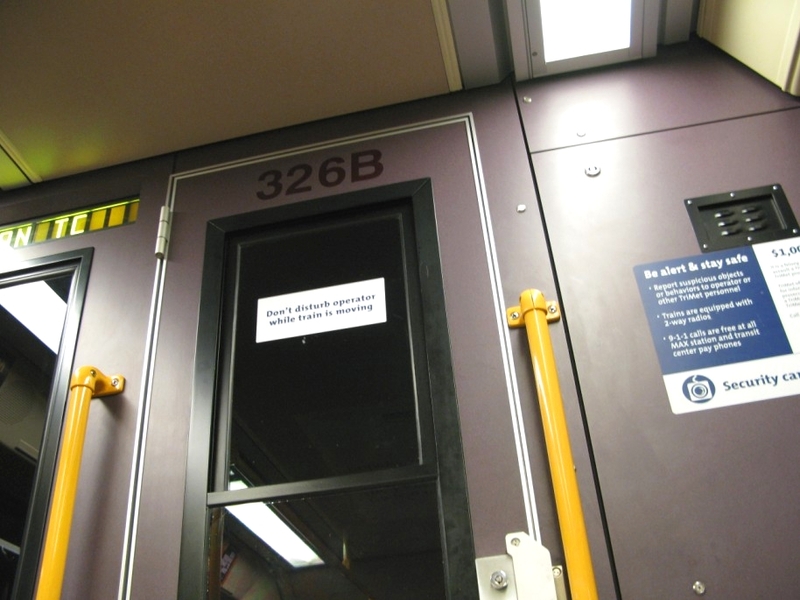 Every door in a train car is numbered from 1 to 8, with door 1 being the first door on the left facing the A cab and door 8 being the last door on the right. 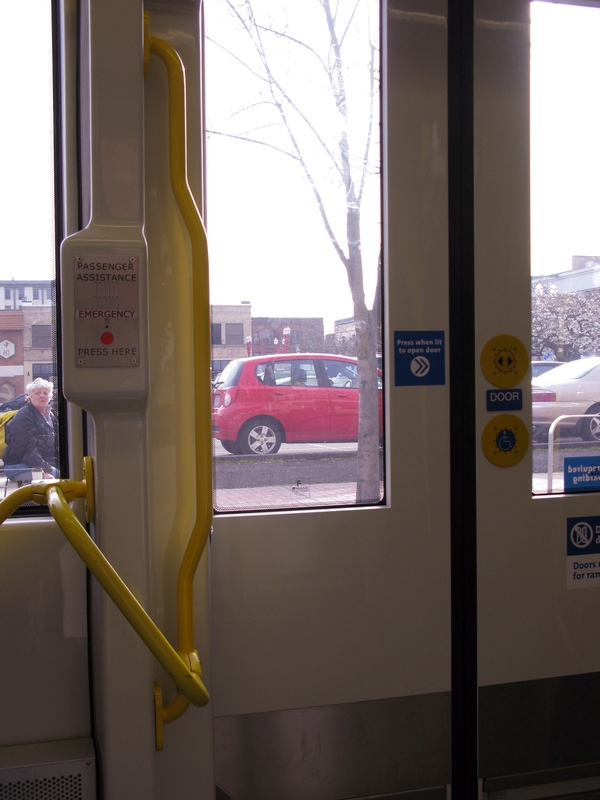 On the right side (facing the A cab), doors 4 and 6 on the low-floor cars (Type 2, 3, and 4) are bridgeplate doors, and on the left, doors 3 and 5 are bridgeplate doors. The bridgeplate is the ramp that can be deployed to assist passengers in wheelchairs or other mobility devices in boarding and exiting the train. 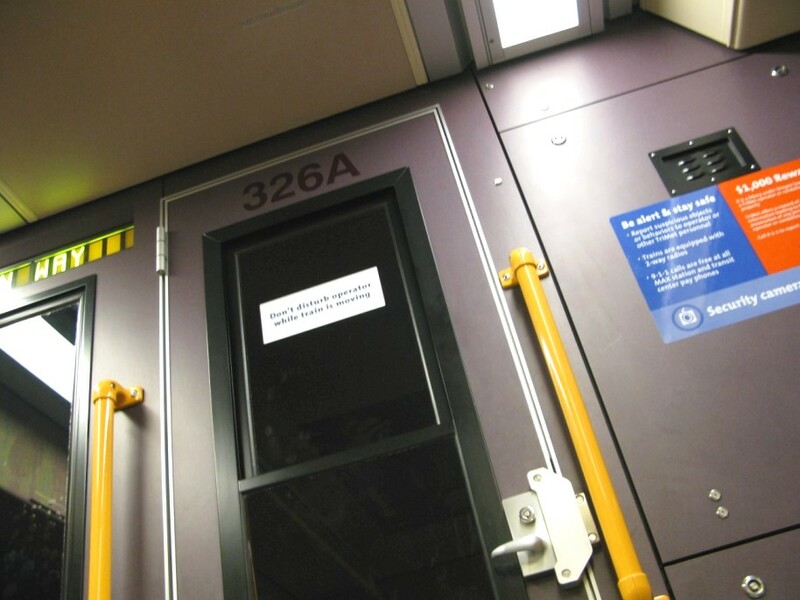 The passenger emergency intercoms are push-to-talk intercoms used if there is an emergency on board the train. 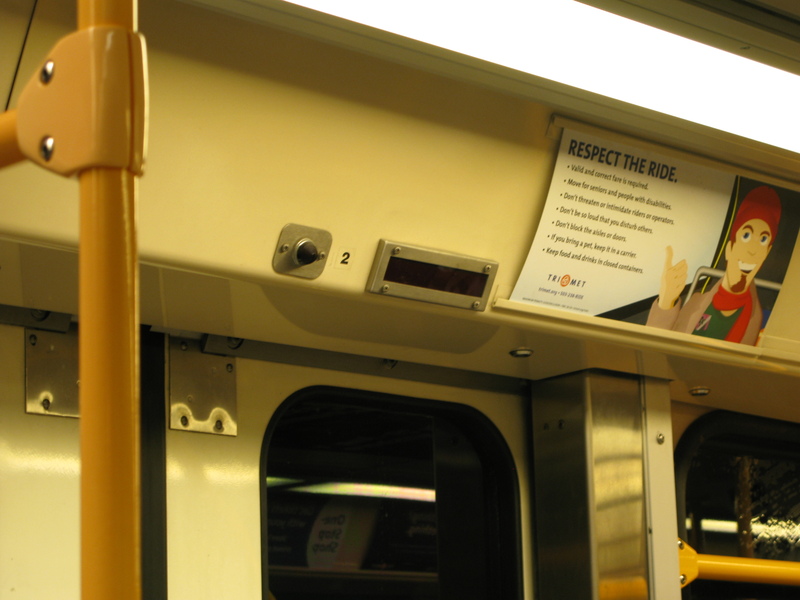 Good things to use this button for – alerting the operator if a passenger has a medical emergency, if something happens that requires police involvement, smelling something burning onboard the train, spotting something that looks like it could be a mechanical failure on the train, etc. Bad things to use this button for – a shiny thing for your toddler to press, as a means of asking the operator what time it is or if this train goes downtown, or as a means of asking the operator for advice on your romantic life. Yes, that has happened. 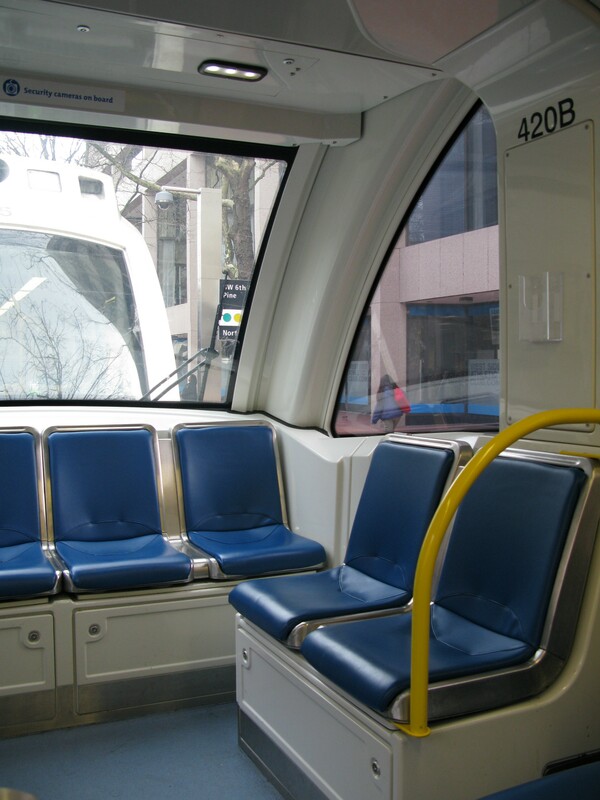 In the Type 1s, you can find the emergency intercoms to contact the operator by looking above the seat located to the left of the cabs. In the Type 2s and 3s, the intercoms are located near doors 3, 4, 5, and 6. 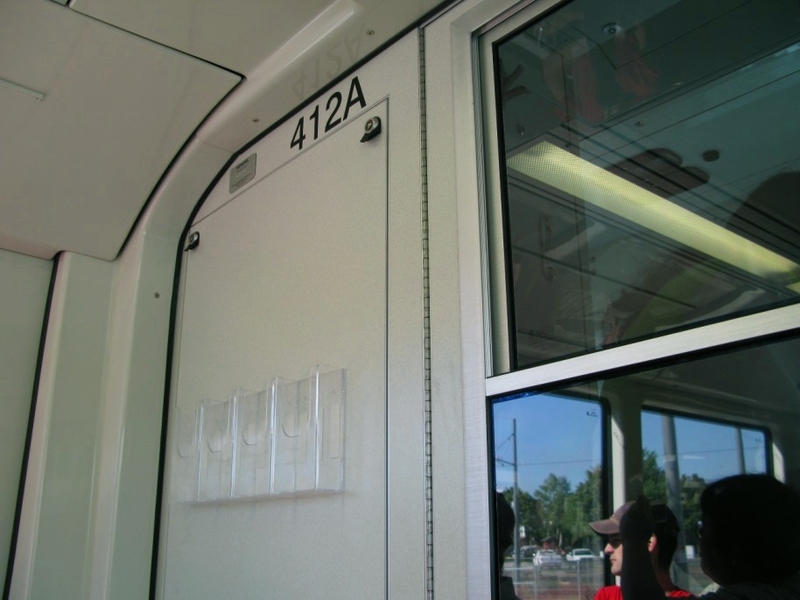 In the Type 4s, there are intercoms at doors 1, 4, 5, and 8. Type 1s have no readerboards. 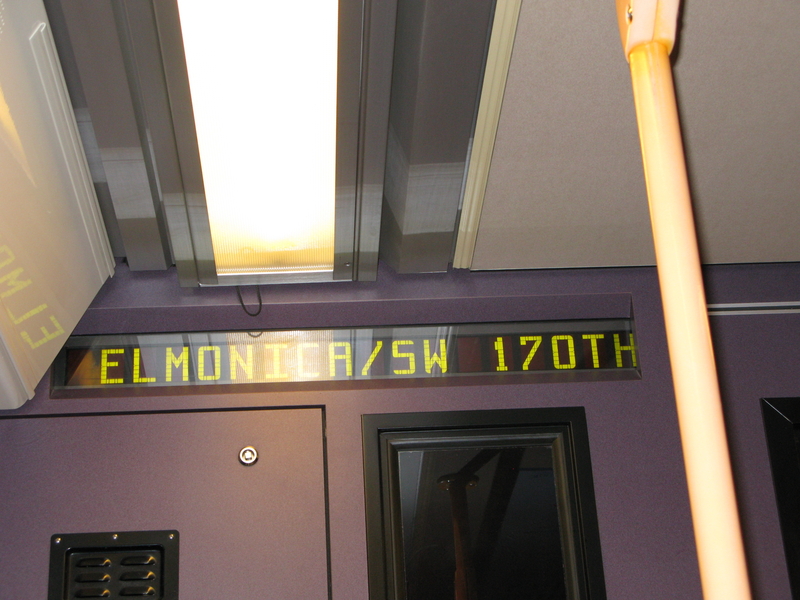 If the readerboards are dark or aren’t showing the right stop, let the operator know – it’s not always obvious from the cab if the readerboards aren’t working right. 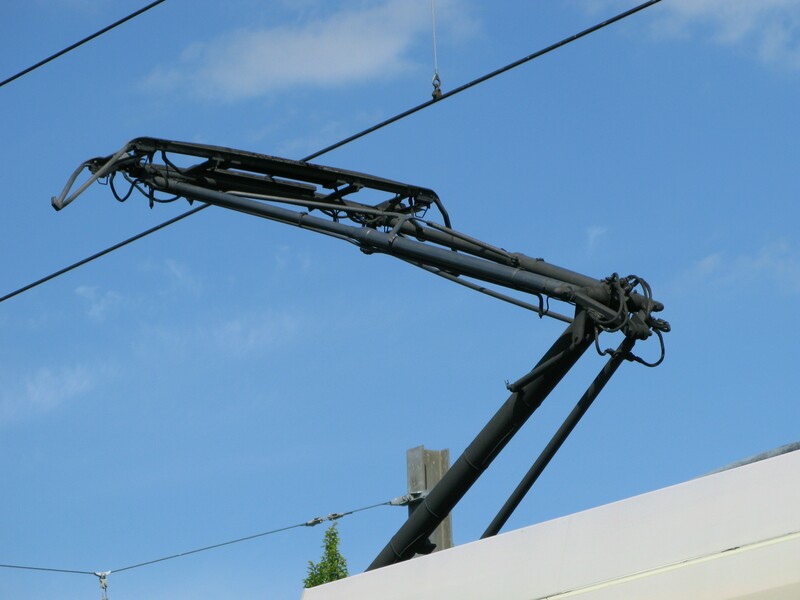 The pantograph, frequently abbreviated to “pan”, is the spring-loaded arm that’s part of how the train draws power from the overhead wires, aka catenary. 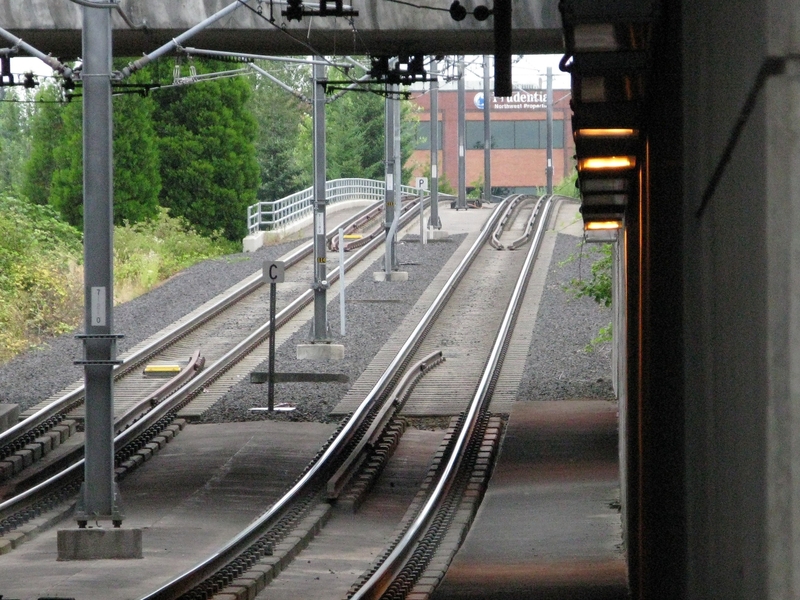 By design, the pantographs press upward on the catenary. 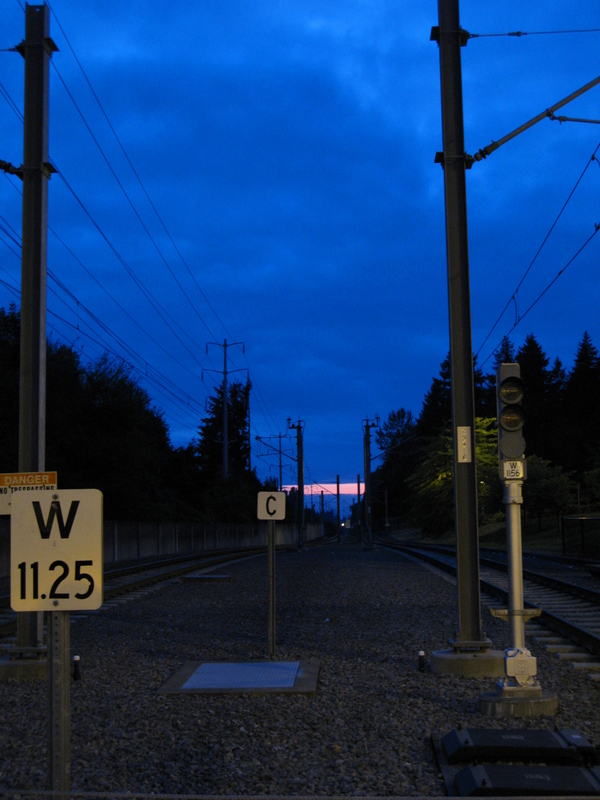 Where there isn’t a lot of clearance between the catenary and the train, the pantograph folds nearly flat on itself, as seen here at Sunset Transit Center. 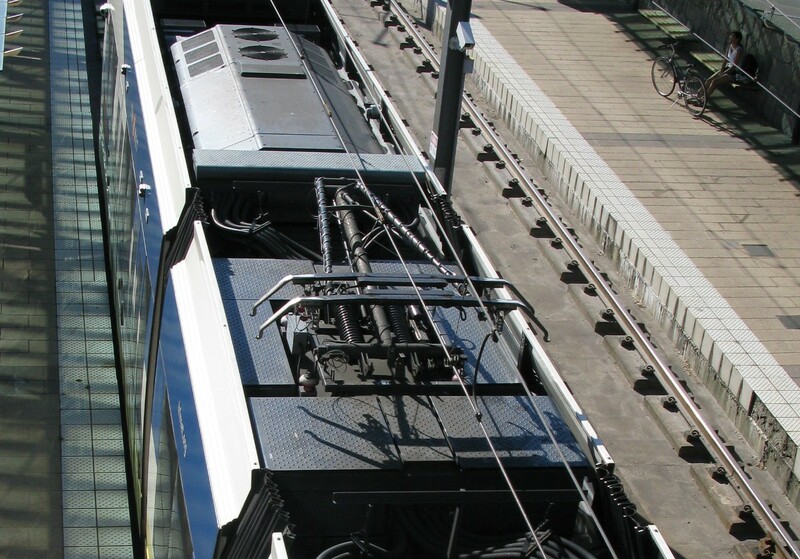 The bow collector (presumably named that because it’s shaped like a bow) at the top of the pantograph arm is topped by a carbon shoe, which is the part that directly contacts the wire (which, not coincidentally, is called the contact wire). 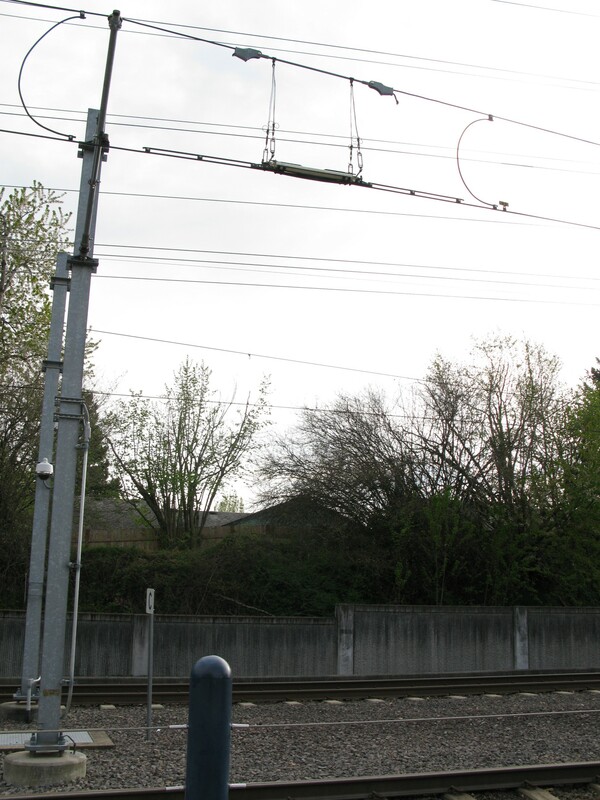 The carbon shoe is gradually worn down by the overhead wire and eventually needs to be replaced. 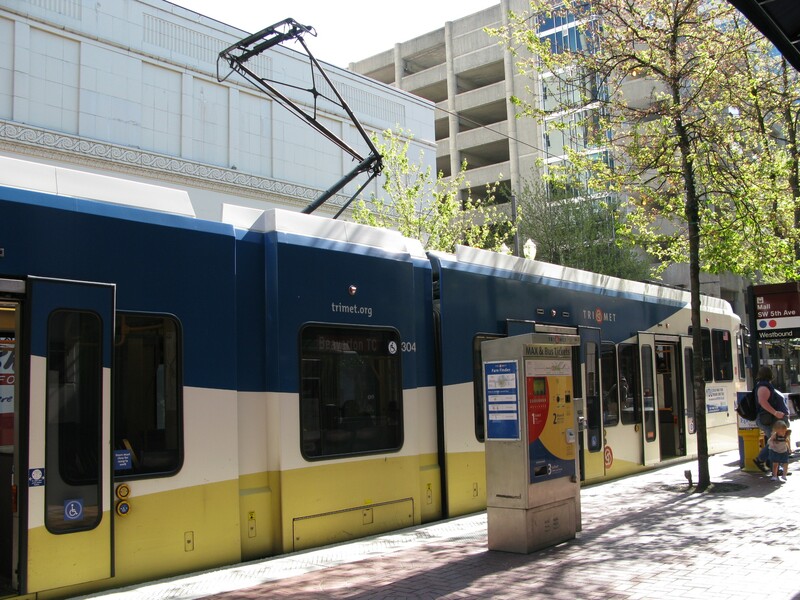 To wear it down evenly, the overhead wires zigzag back and forth instead of going in a straight line which would only wear down one part of the carbon shoe and potentially break the pantograph. 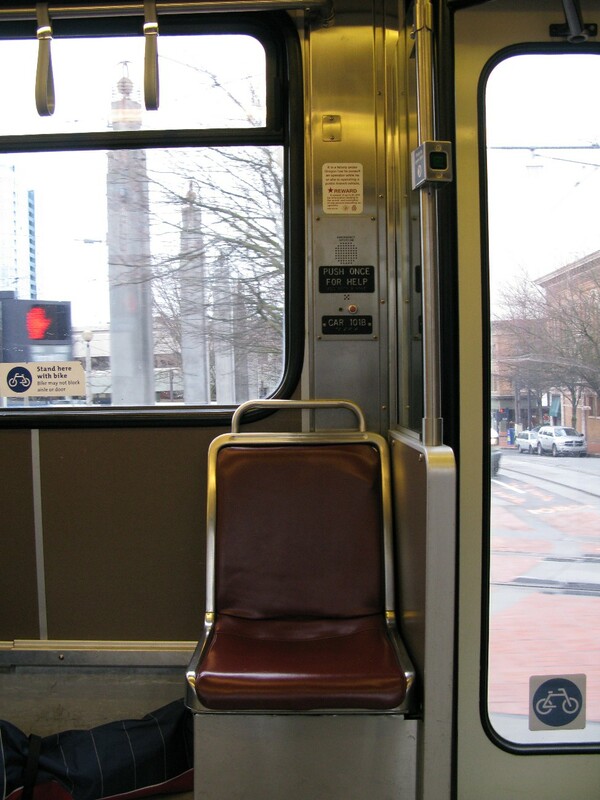 This is not a TriMet video, though I’d love to set up a camera on top of a MAX train to get something similar – it shows both how the spring-loaded pan rises and falls depending on how much distance there is to the wire above as well as the back-and-forth zigzagging of the wires so that the carbon shoe wears evenly. 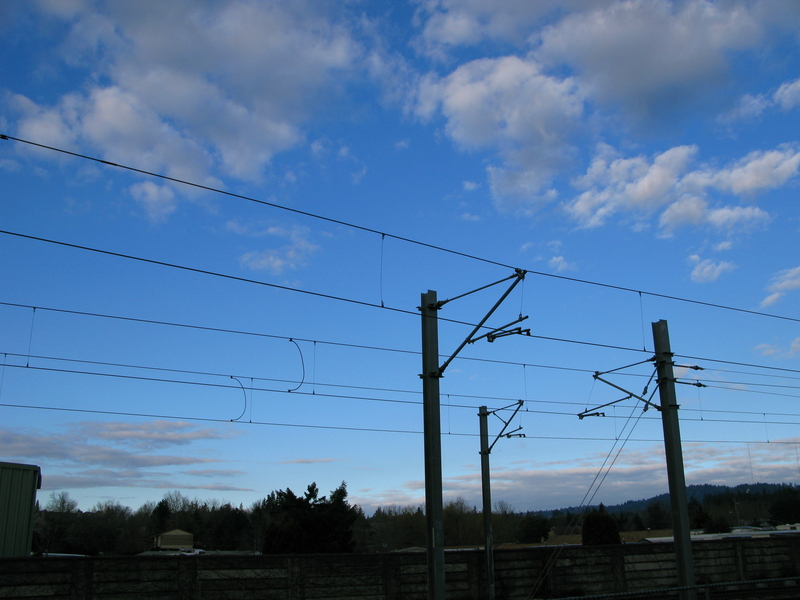 The overhead wire ranges in voltage from 675-925 volts, averaging around 750 volts, direct current. In other words.. I used to have a link here to a Philadelphia news article where a 15 year old climbed a cat pole to touch the overhead wire but the link expired. He survived but was severely burned. A simple Googling shows a lot of fatalities that happened when people climbed on top of trains or up cat poles to touch the wires or the pantograph. 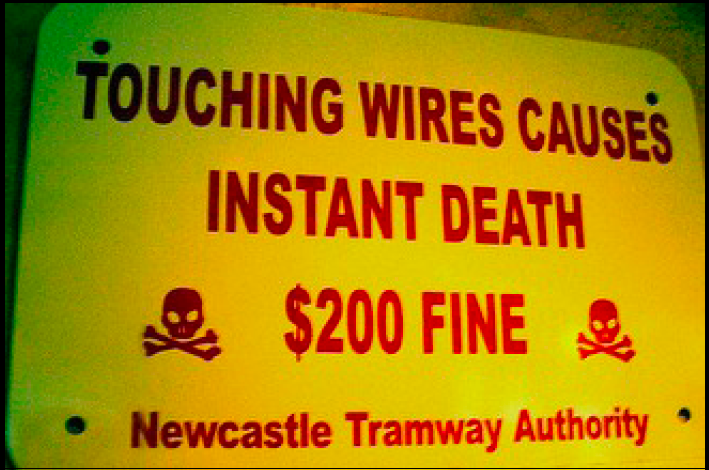 I shouldn’t have to say “don’t touch something high-voltage” because it should be obvious that that’s a really bad idea, but I’m all about spreading the safety message even when it means stating the obvious. 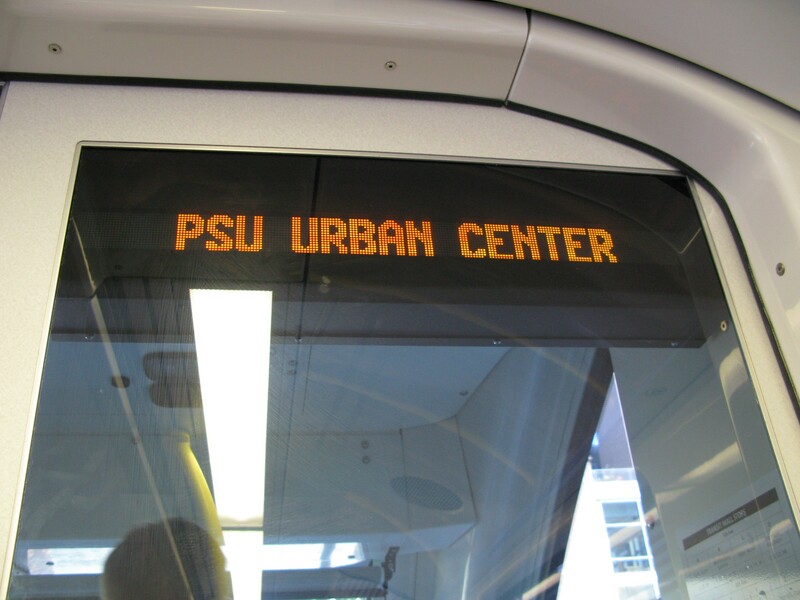 In low-speed areas, such as downtown Portland or in the yards, a single-wire trolley system is used. Throughout the downtown alignment, you’ll see how the contact wire is a single wire strung through other supporting wires. 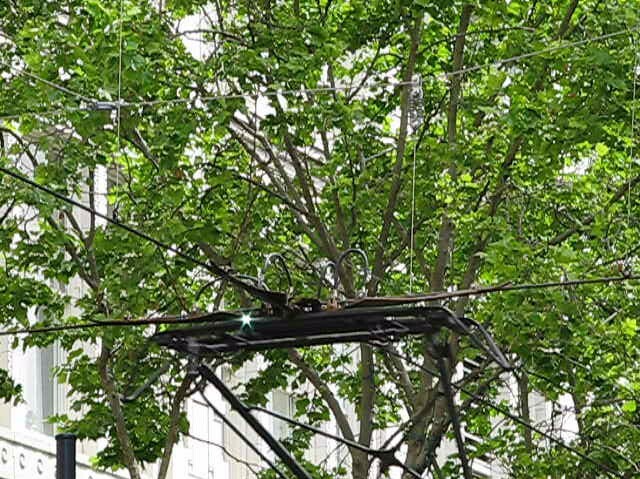 In high-speed areas, the overhead wires look like this. The upper wire is called the messenger wire, which supports the lower contact wire. 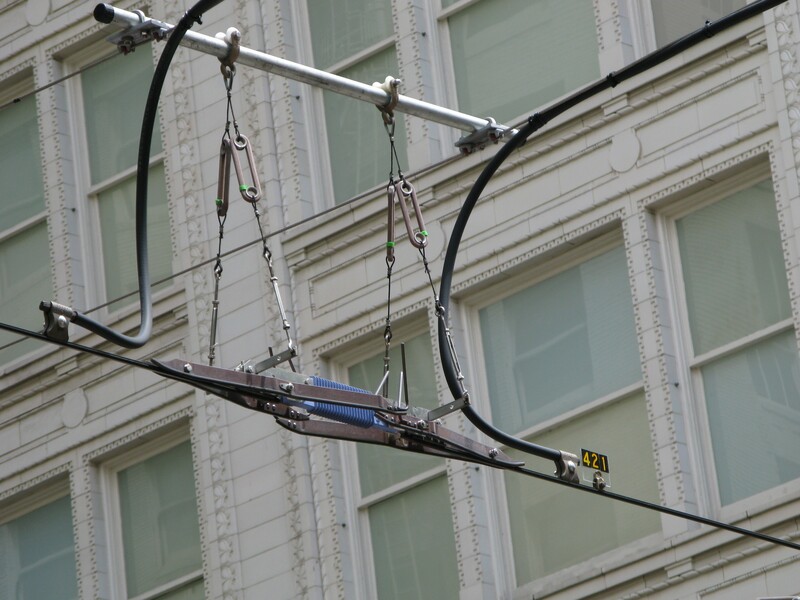 On some of the catenary poles, you’ll see tension weights hanging. 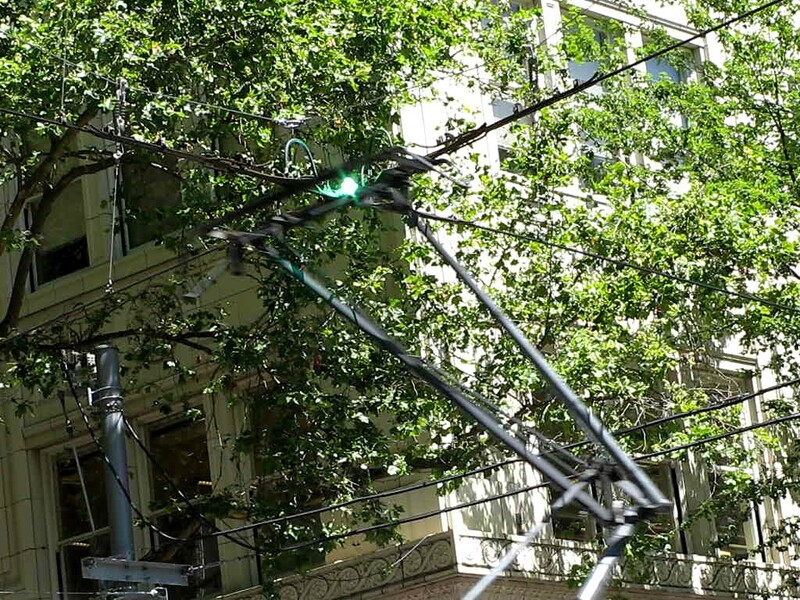 I’ve already gone over how the weights work in another post – but to summarize, they rise and fall as the temperature changes to keep tension in the overhead wire. Throughout the alignment are section isolators (also known as section insulators) in the overhead wire. These unpowered breaks in the line allow for power to be turned off in one area without needing to shut down the entire system. 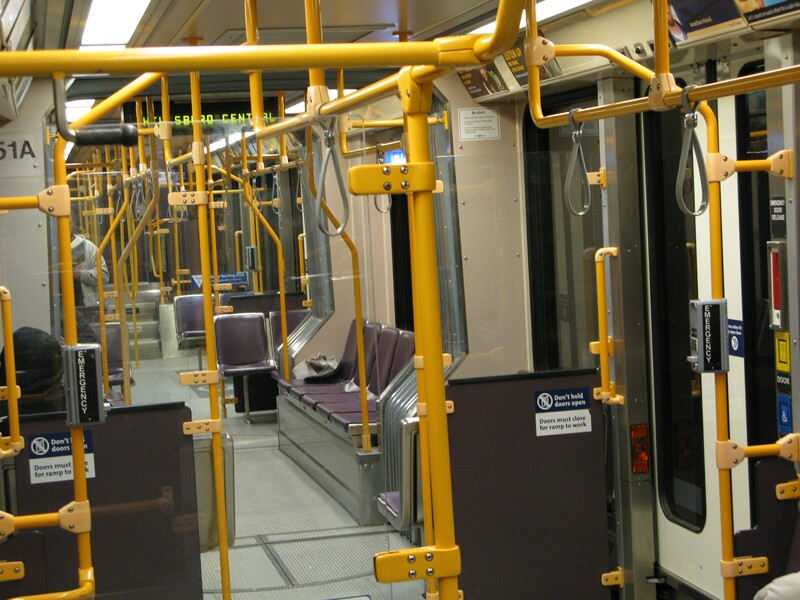 To prevent arcing and other problems, a MAX operator going under an isolator won’t draw power until both pantographs are clear of the isolator. I’ve seen brighter sparks than this, but they’re extremely hard to photograph. 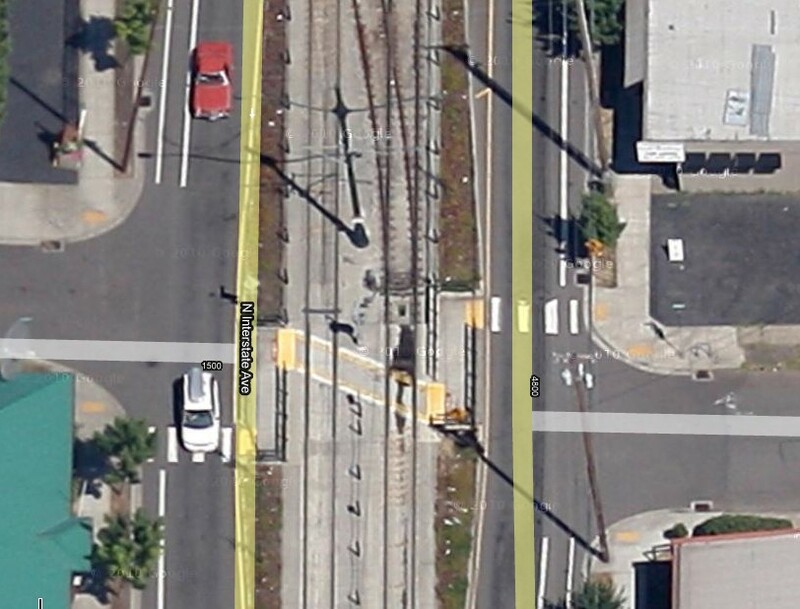 Those pictures are examples of arcing downtown where the Yellow-Green alignment crosses the Blue & Red alignment. If you’re on a train going through where the lines cross over and all the lights in the train go out briefly, this is why. Arcing is not a desirable phenomenon, and excessive arcing can sometimes be indicative of a very serious problem. 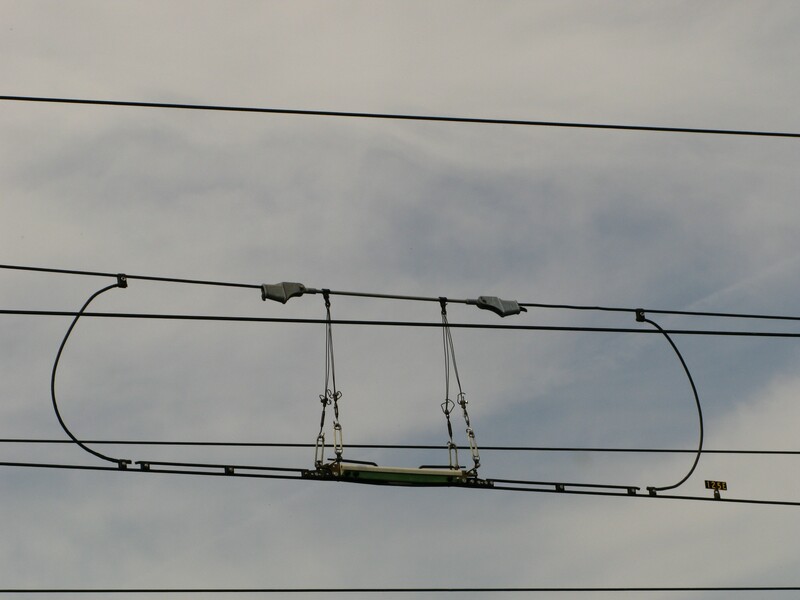 It seems that pictures of arcing between pantographs and overhead wires is a popular topic that people search for, so I’ve added some additional photos of arcing. And then I added some more! As a visual reminder of where the section isolators are in high-speed areas where a train is likely to be in a propulsion mode greater than those used in low speed areas, there are C and P signs along the alignment associated with the isolators. When the front of the train reaches the C sign which will be located prior to the isolator, the operator must coast, and therefore not draw power from the catenary until reaching the P sign, at which point the operator can resume a propulsion mode drawing power because both pantographs have passed beyond the isolator. In most sections of the alignment, unless you know the isolator is there, you most likely won’t be able to feel the train going into coast and back, but offhand I can think of two sections where it’s fairly obvious to passengers – westbound out of Willow Creek (where this picture was taken) and eastbound out of Sunset. At Willow Creek, the isolator is so close to the platform that the train will not pick up much speed before the operator must coast, so westbound departures from Willow Creek often feel very slow. At Sunset, the isolator is on an upward hill – note the C sign at the base of the hill – so gravity is working against the train coasting uphill and you can feel a slight jerk and drop in speed as the train goes into coast. If the operator doesn’t pick up enough speed leaving Sunset before coasting up the hill, the ascent will feel unusually slow. And…. I think that about covers the basics. Really the biggest (only?) 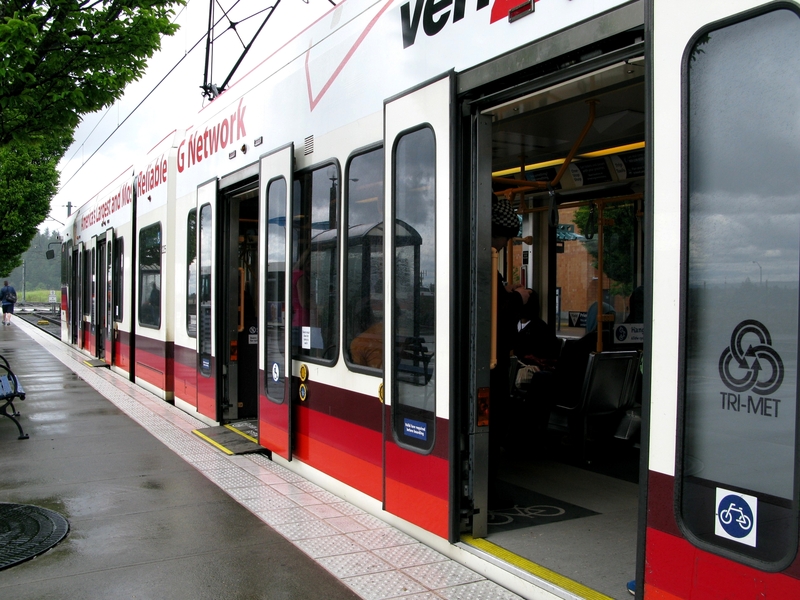 takeaway message from this for TriMet passengers is don’t ever touch the overhead wires since knowing the rest of this stuff isn’t a prerequisite for riding the trains but staying away from the catenary wires is just a good idea! But as always, I think the intricacies of the system and all of the things that go into making it work are fascinating, even if most people don’t care/don’t need to care about them. Don’t linger between the tracks! The Z-crossing railings on both sides of this walkway force people to face the direction of oncoming trains before crossing – this is a relatively recent addition at Elmonica and other platforms to improve the safety of the walkway there since the substation makes it a blind corner for both pedestrians and train operators. And the freshly painted “STOP HERE” (looks like they haven’t gotten to the side near the parking lot yet though) and “DON’T STAND HERE” are nice improvements as well. 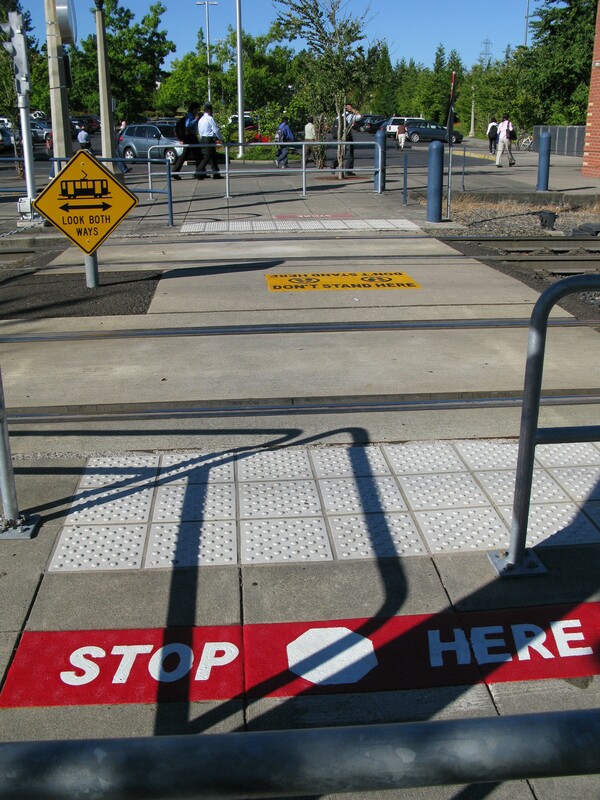 Z-crossings have long been in use on Burnside and Interstate, but it’s only over the last few years that TriMet began channeling people into Z-crossings on platforms. 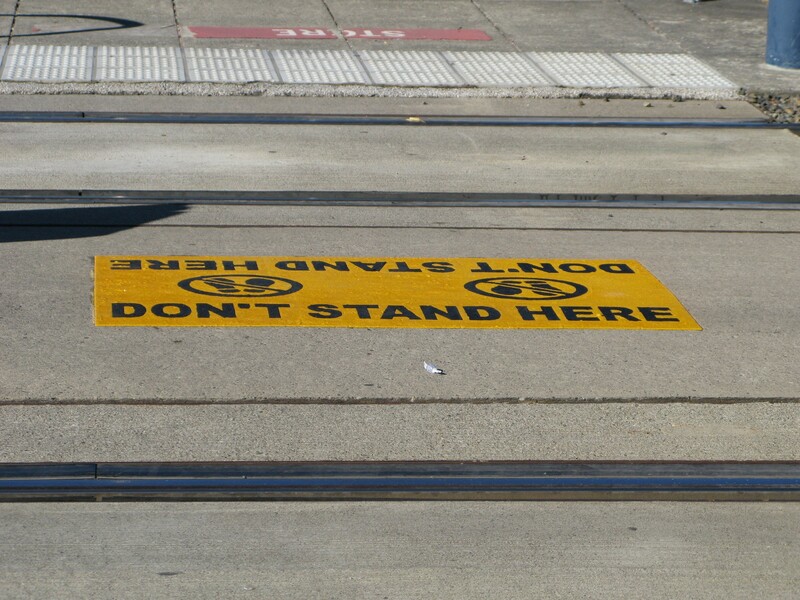 While I wish it were simple enough that people would stop and look both ways before they walk onto railroad tracks, the plain truth is that many, if not most people don’t. So anything done to accommodate and counteract poor decisions that people make around trains in order to prevent accidents is great news as far as I’m concerned. I don’t have children in the school system in Portland, so I don’t know how much (if any?) 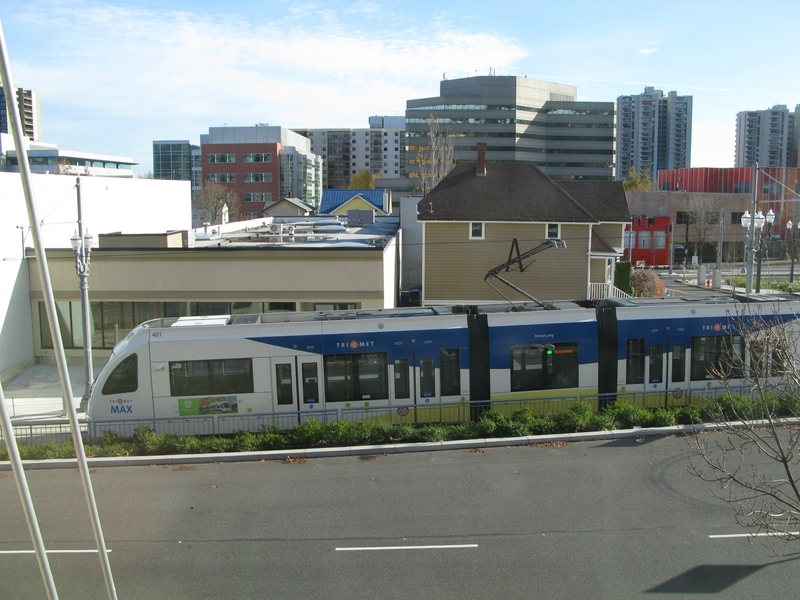 time is spent teaching kids that hey, there are these pretty, shiny, fast-moving trains going through neighborhoods and school zones in the Portland area, so here’s how to be safe around them because they are not toy trains. Believe me, few things are as heartbreaking to see from a train cab as a parent taking their small children by the hand and running in front of your moving train, or sometimes pushing a baby stroller in front of an oncoming train. Aside from the obvious risk involved, what is that teaching those kids? 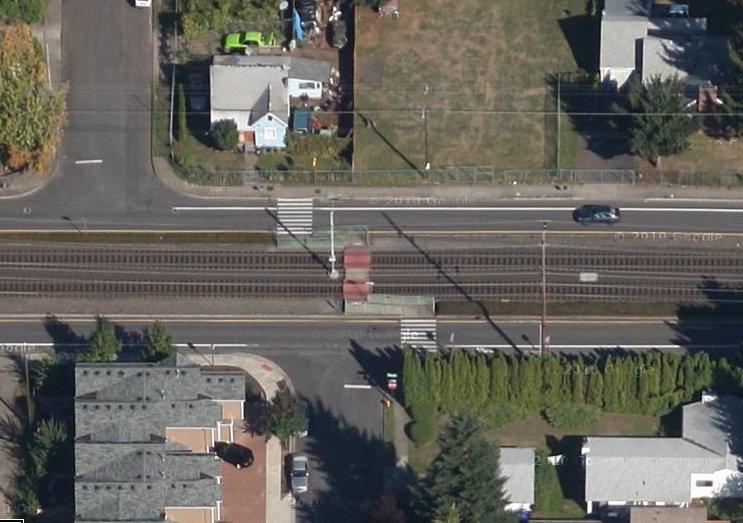 Nothing good – I can’t begin to tell you the number of times I’ve seen youths trespassing in the right of way, crossing where there is no pedestrian access, walking around in the tracks near platforms, running in front of oncoming trains so they don’t miss it, etc. But sadly there are plenty of adults who do all of these things too, so who is their good role model? I think events like this one should be standard and ongoing for kids in Portland so that Portlanders learn from a young age how to be safe around the trains and rail safety becomes part of the safety culture in Portland, not just at TriMet. 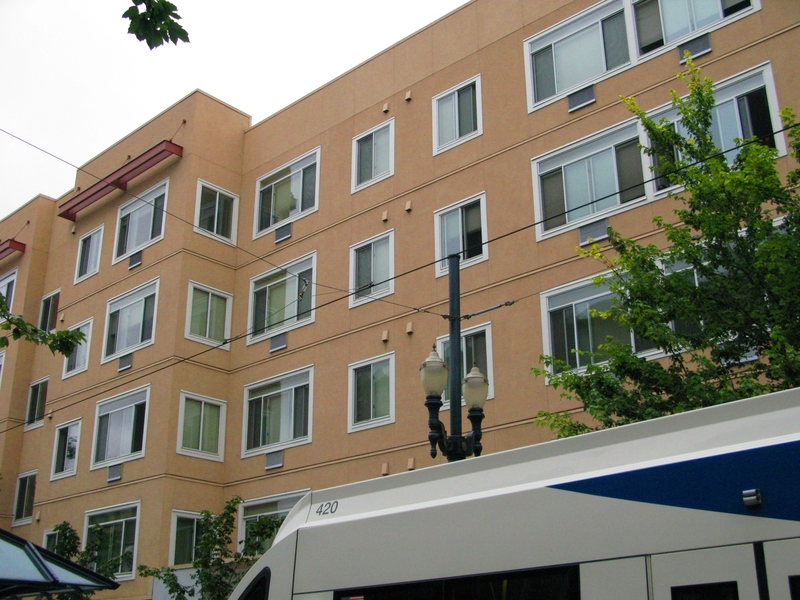 What were the final contract offers by TriMet and the union that are going to arbitration? Here you go – and many thanks to the person who provided this to me since I hadn’t been able to find any news outlet that posted the documents. The first three pages are the union’s final offer (essentially, maintain the status quo and continue the previous union contract). The remainder is TriMet’s final offer, which I have only had time to skim and so won’t comment on it, but it has a lot of line-item editing of the original union contract.